Dizgraceland: Sea Monkey Business: An Expose! I know you can't make a rash statement about accepting that nothing is as advertised and pointing out that sea monkeys aren't really monkeys and just leave it at that. I'm pretty darned sensitive about the subject. As a kid, I read lots of comic books and in those pre-eBay days (if you can imagine such a time) the back of comic books beckoned me to buy really useless stuff that I couldn't live without. I mean, just look at that ad for Sea Monkeys. They look like characters right out of Dr. Seuss. I had to have them. So I saved my nickels and dimes and sent away for my own little circus of Sea Monkeys that they promised you could train and entertain people with. Imagine my suprise when they arrive in three packets -- water purifier, instant life and growth food (if you want to relive my experience without the heartbreak, go to the Virtual Sea Monkey page). "Sea-Monkeys are a true miracle of nature. They exist in suspended animation inside their tiny eggs for many years. The instant-life crystals, in which the eggs are enclosed, preserve their viability and help to extend still further their un-hatched life span! Sea-Monkeys are real Time-Travelers asleep in biological time capsules for their strange journey into the future! Scientists call this amazing rare process "cryptobiosis" which means, "hidden life". Among the types of life on Earth that are cryptobiotic in early stages of development are the seeds of higher plants (wheat grains from the tombs of the ancient Egyptian Kings have sprouted after being sealed in urns for more than 2,000 years), the larvae of certain insects, and the thick-shelled eggs of some crustaceans such as Daphnia, seed Shrimps (Ostracods) and Brine Shrimp (Artemia salina). Sea-Monkeys too belong in this category, since they are a variety of Artemia. A relative of Lobsters, Crabs, Fairy Shrimp and other crustaceans, instead of originating in the ocean, Artemia are found in salt lakes and salt evaporation flats. The waters of these areas are often so salty that Artemia may be the only non-microscopic animal inhabiting them." I envisioned myself in a white lab coat asking Igor for more power as I poured the instant life packet into the purified water container. I stirred and waited. In about a week I saw the specks that were emerging from their cryptobiotic state of suspended animation. These looked nothing like the cute little Whoville-type characters depicted on the back of my Green Lantern comic. These were stupid water bugs...brine shrimp. What a gyp! And as they grew, they didn't look any more attractive. I read through the booklet that told you how to "train" them to do tricks. You cold make them move from one side of the tank to the other by putting them in a dark room and shining a flashlight on one side of the tank. The stupid things would swim towards the light. This really sucked. I'd been duped. So, I did what any responsible 10-year old would do. I let the tank dry up and returned the Sea Monkeys to their cryptobiotic state. I always felt kind of bad about that. So who was responsible for duping little kids into buying brine shrimp? 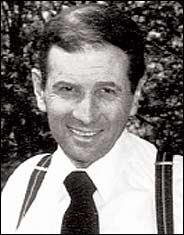 His name was Harold von Braunhut. Turns out this same guy also marketed X-ray specs (these prompted quite a few adolescent fantasies for me), Crazy Crabs (hermit crabs) and invisible gold fish (he guaranteed the owners would never see them). Apparently von Braunhut built a fortune out of his mail order business. Braunhut held 195 patents on novelty items but the Sea Monkeys were his real claim to fame. He died in November 2003 and when he died so did his generous contributions to the Aryan Nations. Go figure. Harold is memorialized on the Sea Monkeys Worship Page (yes there is such a page). If having a Sea Monkeys Worship Page wasn't scary enough, there was a television program that aired briefly (three months) in 1992 called the Amazing Live Sea Monkeys. One of the eleven episodes that aired was (and I'm not making this up) "Sea Monkey of Love." And they cancelled this program? My brothers conned me into sending for this puppy and a revolutionary war soldier version as well. Even the Sea Monkeys were a better deal. The hundred soldiers were about an inch tall and the "durable plastic" wasn't. 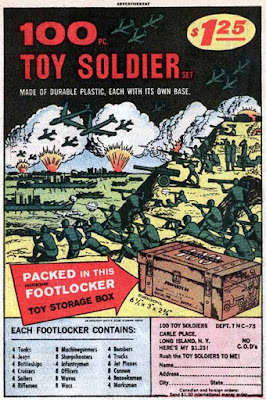 The footlocker "toy storage box" was a cardboard box about 4" x 6" big. This is why I accept nothing is as advertised. But I'd still like to get me a pair of those X-ray specs. This brings back such memories . . . I remember my own disenchanting Sea Monkey experience too well. I wanted the Seuss creatures. Where were my Seuss creatures? I understood that I was purchasing Seuss creatures, damnit! And so I took to reading the fine print -- all from the tender age of eight. Well, I'm pleased to see that each generation is being taught the PT Barnum school of marketing lesson through Sea Monkeys. I guess one is never too young to learn to accept disillusionment. My brothers and sister and I collected aluminum cans in order to raise the money necessary to purchase our monkeys. We got a sample of "magic crystal rocks" with our purchase. Maybe the two in conjuction did work magic...cause I swear I saw a tiny little sea family in our tank. But then, I also believed in Santa Claus, Tooth Fairy and Easter Bunny. It's one thing to lie to kids...it takes a real #*&^% to make money off that lie.